You can request a price quote and a free viewing by contacting 020 3746 3201 or sending an online request. Rubbish Collection Company in East London - The Highest Rating On The Market! Rubbish collection service in East London is provided by Better Cleaning Company. Top-notched cleaning organization with substantial expertise in removal services, as well. We have been on the market for 10 years and we do know how to satisfy and please our consumers. As a matter of fact, your constructive feedback is the best price we receive from our reliable rubbish removal solutions. Accepting this as our practice, we have succeeded to build up the fasted and the most affordable rubbish removal offers across the whole East London territory. Note that we are aware of all the dumpsters and recycling centres in Great Britain, so wherever your location is, we will move the garbage to the closest centre without disturbing you to seek for such. 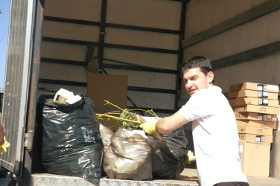 We are skilled in offering hassle free and fast garden waste collection East London IG. We will collect all hedge, grass, tree trimmings, hay, leaves, unwanted plants and weeds, wood and some other garden waste and will load and dispose of it at a good price. Our waste management staff can deal with green waste removal, brown waste removal and recycling & dumping. Originally started as a professional cleaning company, Better Cleaning Company has a great potential to become a leader in rubbish collection East London sector. We have modified the most typical standards in the field in correspondence to the latest methods and trends in safe and eco-friendly junk collection. As a result of our hard work, several researches and expertise of more than 10 years, our rubbish removal services is now one of the best choices you've got in London. To complete the mission of junk collection - regardless its type - we have great groups of expert junk removal specialists, who are well-trained and proven. They are totally insured and vetted, ready to deal with any volume and kind of garbage. Please, keep in mind that we deal with any type of trash, excluding only medical and hazardous products, food and paint. Rubbish Collection In East London IG. Fast Bookings! Benefit from the many years of experience which Better Cleaning Company had offering rubbish removal East London IG services. We are the most reliable rubbish waste carrier in the area. Our experienced two men groups will turn up on time and start loading immediately if you are satisfied with the price given. We have inexpensive rates and guarantee quick arrival if you want same day service.Call now and 020 3746 3201 we will also recycle instead of you, so leave the rubbish collection to us and book our service right away!